Happy Christmas Eve! It's the fourth week of Advent and so far this Advent season we've looked at the innkeeper, Herod and the shepherds (again). Today we're going to look at the Wise Men and their part in the Christmas story. Here's how their part in the story begins: "Jesus was born in Bethlehem in Judea, during the reign of King Herod. About that time some wise men from eastern lands arrived in Jerusalem, asking, “Where is the newborn king of the Jews? We saw his star as it rose, and we have come to worship him” (Matthew 2:1,2). The first thing I want to point out about the wise men is that they were astronomers and scholars, people who would have noticed the appearance of a new star in the sky. The star wasn't like the star we usually see on Christmas cards, so huge in the sky that you'd have to be blind to miss it. Can you imagine the panic that would have gripped the common people to have such a giant star suddenly appear in the sky? No, these were men who studied the stars and noticed when something small changed. I have heard it speculated that they were also men who would have known the prophecies of Daniel, who was taken captive to the land of Babylonia hundreds of years earlier, which might explain how they knew about the long awaited arrival of a new king of the Jews. The second thing that interests me about the wise men is that they were not from the nation of Israel and they had no affiliation with God. They weren't His people. And yet, when they noticed that new star, they set out in search of Jesus so they could worship Him. Sometimes people think that if they weren't raised in church, then God doesn't want anything to do with them. Whether it's because they think they're not good enough or because they think He's not interested in them, they feel like they can't come to God. But here are men from another country entirely, men who had no connection to God's people, and God put a sign in the sky that only they would recognize. It was like their own personal invitation to come meet Jesus. The wise men went to King Herod first. Where else would you expect people to look for a newborn king, but in the palace of the present king? But when they found that Herod didn't have a new son, they continued their search. "After this interview the wise men went their way. And the star they had seen in the east guided them to Bethlehem. It went ahead of them and stopped over the place where the child was. When they saw the star, they were filled with joy! They entered the house and saw the child with his mother, Mary, and they bowed down and worshiped him. Then they opened their treasure chests and gave him gifts of gold, frankincense, and myrrh" (vv. 9-11). What a strange assortment of visitors Mary welcomed to see her baby! First there were the shepherds, the lowest of the low in society, and then came these wise men from the east who could afford to give such lavish gifts. Both groups had their own special invitation from God that told them how to find this special child and both groups immediately set out to find Him and then rejoiced when they found Him. Jesus, Himself, is our special invitation to come to God. By coming to earth as a baby and then dying on the cross as our Savior, Jesus opened the way to allow everyone to come into God's presence. 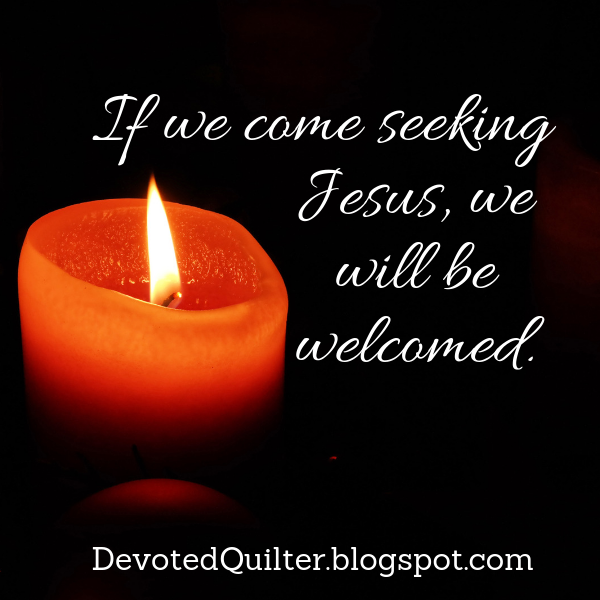 It doesn't matter if we feel like we're the lowest of the low in society or if we feel like outsiders, if we come seeking Jesus, we will be welcome.